White Chia Seeds, Almond Butter, Brown Rice Syrup, Almonds, Organic Brown Rice Crisps (Organic Brown Rice, Organic Brown Rice Syrup, Sea Salt), Chicory Root Fiber, Rolled Oats, Arabic Gum, Natural Flavors, Sea Salt, Mixed Tocopherols (Natural Vitamin E). 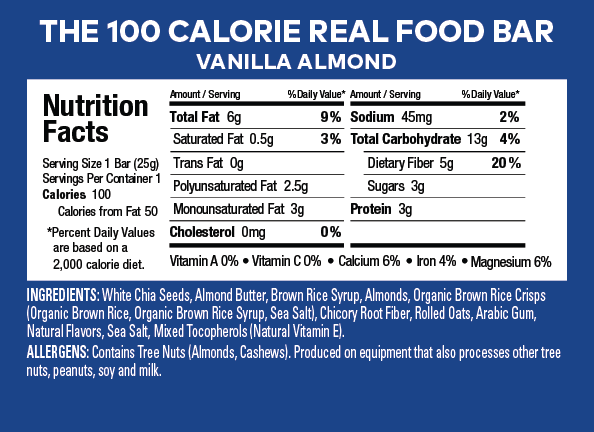 Contains Tree Nuts (Almonds, Cashews). Produced on equipment that also processes other tree nuts, peanuts, soy and milk.